The MICH (Modular Integrated communications Helmet) TC 2000 is the replacement for the PASGT. The MICH is now used by the US Army/Airforce along with many other units around the would. It comes in tan or olive for a desert or woodland environment. Remark that the helmet is a replica! It can not by used as real head protection! The shell is made of high impact ABS plastic and has a rough finish to it. The MICH has an updated suspension system which consists of 7 soft pads that fit in to the helmet by means of 16 Velcro disks so the fit can be tailored to the wearer. This really enables you to suit the helmet for your own use. You don't need to focus on your equipment anymore but you can focus on the mission! The helmet is held on to the head by means of a 4 point system with a neck pad and opens with one Fastex clip. This helmet got everything you might expect from a helmet. Comfort, weight en usage are just fine. The helmet also looks durable and certainly suiteble for airsoft employment. The helmet only comes in tan and olive drap but you are able to buy several kinds of helmet covers in your favorite camouflage. So this won't be a problem. Even nightvision tools can be mounted on the helmet! So the helmet certainly has a lot of functionality. A nice addition to your equipment. However I still prefer a boonie head or cap, just because the looks and the weight. A geardo’s gear, without a geardo’s pricetag?” Before I begin this review, I would like to genuinely extend my thanks Paul at RedWolf Airsoft for providing me this opportunity to review this excellent vest. For more information about RedWolf, please read their shop review here: Redwolf Airsoft Shopreview. Milspex’s CIRAS (Combat Integrated Releasable Armor System) is a replica of the famous armor carrier used by the USSOCOM. 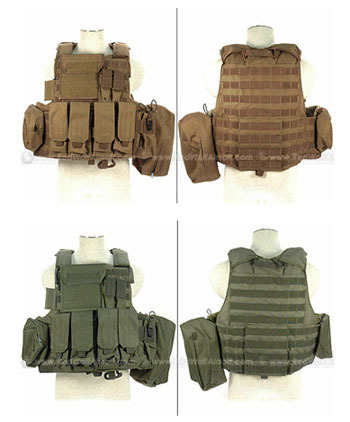 The real vest, manufactured by Eagle, costs an arm or leg for most airsofters, not only is the Milspex version affordable, it includes all the necessary pouches. Eagle produces 2 versions of this vest, the Maritime and Land versions. The vest being reviewed today is the Land Version, which is different than the Maritime Version ( The cummerbunds end anteriorly and is overlapped by an abdomen flap. 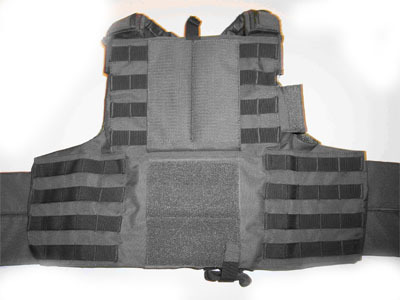 The vest is very light and flexible when compared to the RAV (which is also gaining popularity among our military troops. 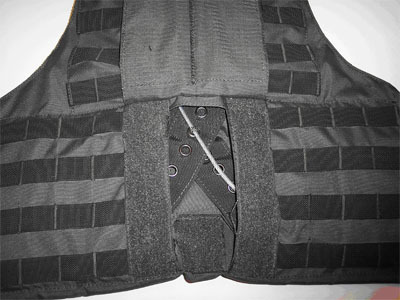 A view of the vest, without all pouches attached. Notice that the back also is covered in MOLLE, allowing attachments for a hydration pouch. 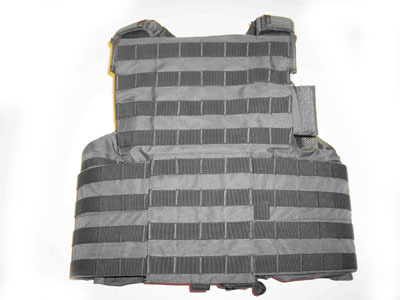 This particular vest is constructed out of 1000 Denier Cordua, which is just about the strongest material available on the market; like other high quality vests, and plate carriers, they feature one inch, military specification webbing across the front and back for mounting various pouches. On this vest, Milspex had made sure to keep up the quality by having the webbing triple stitched. Even though most low cost, replica plate carriers/vests are not exactly the best of quality, I can honestly say that this particular vest does and will meet and even exceed an airsofter’s expectations. The vest doesn’t feel like a “toy” or a “costume accessory”. I have had friends in the military tell me that my replica can almost be mistaken for the real CIRAS because of the quality. Here you can see the extremley sturdy stitching of the MOLLE webbing. 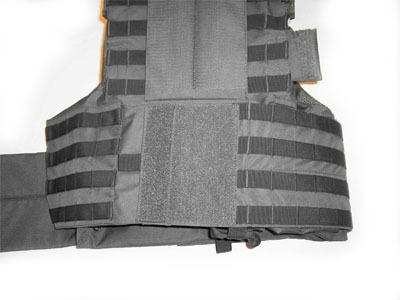 All parts of the vest can be separated an adjusted individually. 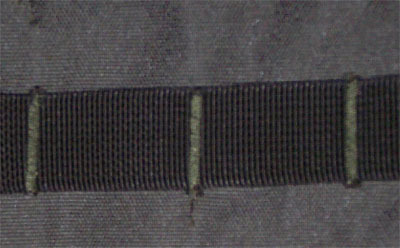 Each part has an attached “strip” of wide webbing with many eyelets, like a belt. Simply have all the “parts” meet together to the back of the vest, and take the loop of para cord and insert it though all the desired eyelets. After this, take the metal cord and slip it through the para cord, and pull it to make it tighter. The process is straightforward; simply imagine the whole process as wearing many belts. After looping the cord through all the parts, simply leave it alone, as the pressure of all the combined “parts” will keep everything tight. The below picture shows the back panel lifted, revealing all the “strips”. Most people are actually confused when asked how to wear this particular vest. And in reality, it is a bit complicated. 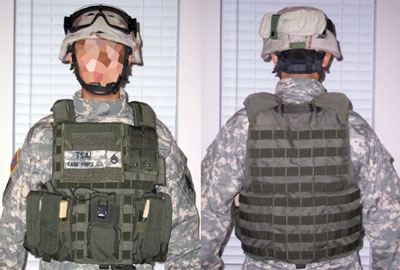 First, place your head through vest, and attach the internal cummerbunds, they are elastic, and should be attached securely, to reduce unwanted movement of the vest during combat. Secondly, lift the front MOLLE flap in the center. Now you have access to attaching the external cummerbunds. Take the cummerbund (either left or right) and attach it to the front, then take the other side and repeat the process. After doing this, simply drop the front MOLLE flap down, and button it back. Since the front MOLLE flap will always move up and down, don’t attach any pouches between the flap and the external cummerbund. Second External Cummerbund attached, and MOLLE front flap down. The vest is now ready to go. As seen above, these are the other CIRAS Land Versions that Milspex produces. The coyote brown (CB) is shown first, and the olive drab (OD) is shown second. The one being reviewed today is the OD vest. Milspex also produces the Maritime version of the CIRAS, also available in CB and OD. Both shades of colors match the “real” Eagle CIRAS. The admin pouch is great for operators because it has a large area of loop Velcro, for adding any patches you desire. The pouch is separated into 2 separate compartments. The lower compartment includes 2 loops of cord that enable the user to slip objects roughly the size of glowsticks, in order to secure them. The back compartment is slightly larger, and is great for putting folded maps, or other small, thin objects. This pouch is usually attached to the front chest. The Dual Pistol Magazine is good not only for holding pistol magazines, but can also hold folding knives, or Surefire 6v flashlights. The lids of each compartment can be adjusted and even removed, as shown in the picture below. Simply put, this magazine pouch is extremely versatile. It was designed for AR-15 type magazines, but can also be adjusted (like the Dual Pistol Mag Pouch). Each compartment in the pouch can hold up to 2 M4/M16 type magazines, or 3 MP5 magazines, all with or without magpul’s. The lids can also be completely removed, at the operator’s preference. Since the lids can be adjusted, it will most-likely be able to fit most other magazines. Since the package includes 2 of these pouches, you will be able to fit up to 8 AR-15 type magazines, and 12 MP5 magazines. This particular pouch is not very fancy, but it gets the job done. The pouch was designed to be able to carry basically anything you can fit inside. But most people find it useful for carrying extra BBs or a small emergency medical kit. In reality, this pouch would usually play the role as a gas mask or medical supply carrier. However, in airsoft, this pouch is very useful for carrying larger items such as your paintball mask, or a large canteen (if you don’t already have a hydration pack). Since this pouch has internal elastic retainers, you can easily attach items to the 2 inside “faces”, thus making access much quicker, than having to dig through the rest of your belongings inside. Quick Release Accessory Pouch for Radios, etc. The sole purpose for this pouch is to hold personal communication radios. The elastic cords secure the radio, while allowing the antenna, adjustment knobs, and headset (if attached) to come out, without interfering with a lid. The pouch can hold radios from personal to industrial sizes, and can be released with a quick release of the buckle. For the price and quality, this vest cannot be beat for its price. It features many pouches which sold separately, are expensive. 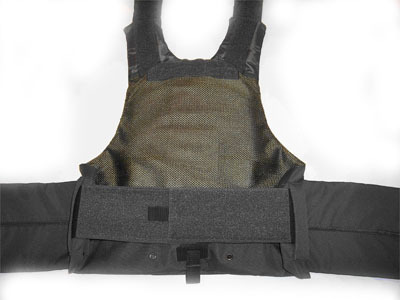 The vest offers complete modularity for personal preferences. The best feature are the 2 cummerbunds, they help secure the vest so it won’t move around during a firefight. NLAIRSOFT.COM is heading more and more into the mobile area, we are working hard to realise several mobile platforms of our website. This page let's you know the current status and possibilities available. For bugs, error and info, feel free to contact us! On May 31st 2010 we launched our very own NOKIA OVI STORE APP for the Symbian mobile operating system. Stay up-to-date with latest airsoft news, events, videos and twitter updates. 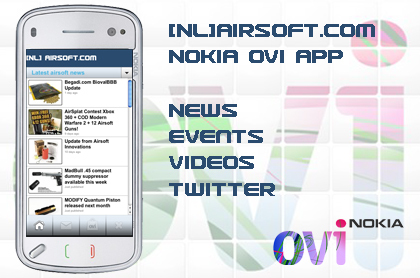 We made a start with the OVI STORE app for Symbian/NOKIA phones. Those we have a recent NOKIA phone, enjoy our app! 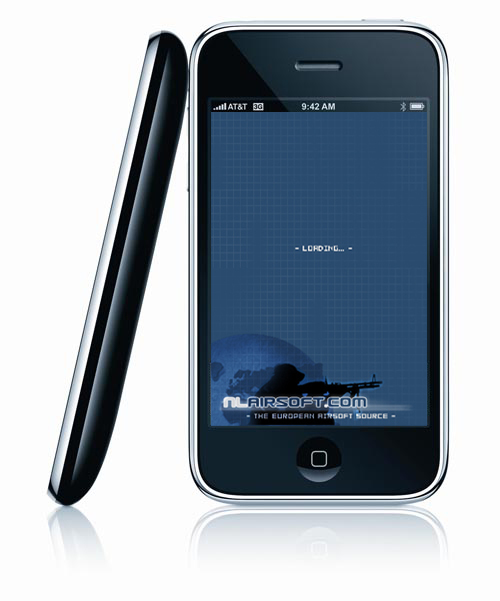 NLAIRSOFT.COM will release this year (2010) our very own native iPhone app! We will start with latest airsoft news and extend the application with airsoft calculators, event updates etc. etc. We are really please we started the development on the app, we hope to apply and get approved in 2010. Pricing of the app will be around 0,79 Euro/0,99 USD. When having any suggestions on the app, please feel free to contact us! UPDATE: Currently we have a developer account and are looking for developers to participate in this app, please contact us when interested! Android is nice, fun and getting bigger and bigger. We really would like to launch an app for Android, first the iPhone app has to be ready. Developers for Android are welcome! Currently we are testing with a mobile Joomla! solution which is suitable for nearly all mobile browsers! Stay tuned! MODIFY contacted us to test their upgrade parts for airsoft replica's and to provide feedback and improvements on these items. First some more information on MODIFY. MODIFY is a company from Taiwan specialised in precision metal parts, turning industry tools and precision machine attachments such as Airsoft Custom Parts, R/C Car Upgrade Partsetc. They have 40 years experience in the industry and their products have a high reputation for quality and value. However MODIFY was unkown for us and we suppose quite unknown in Europe. They mainly aim at high quality airsoft upgrade parts and accesoires. We are also very pleased that they are interested in consumer feedback and that they are willing to listen to feedback to improve their products even more. We would like to thank MODIFY for providing this opportunity to NLAIRSOFT.COM. Please read along and find out more about MODIFY and their airsoft upgrade products. To be clear we have tested parts for M16/M4 series, however MODIFY provides upgrade parts for nearly all Tokyo Marui replica's! For those who don't have a clou how the internals of an AEG work, please find the art impression below to give you an idea. Thenks to Mechbox.com for the great artist impression! The upgrade kit comes nicely packaged, with the parts snugly fitted into the foam nice and compact. The kit contains the following: cylinderhead, cylinder, piston, pistonhead, nozzle and the springguide offcourse. Actually all the parts look very well built, well designed, good finish and solid! We were very impressive and glad to see we have received some top quality material here... The modify kits are there for all sorts of airsoft replica’s, as we mentioned MODIFY provides for nearly all Tokyo Marui and compatible models upgrade parts. The MODIFY stainless steel cylinderhead is a cylinder head with a double O-ring so that it has a better seal. On the MODIFY cylinderhead there is also a foam ring, the foam ring has 2 advantages; first it makes your gearbox quitter and second because of the foam ring there is less stress on your gearbox shell when your piston hits it. I took the cylinderhead and it fitted nice into the cylinder. However there was a small problem which we have passed through MODIFY. When installing the cylinderhead to a reinforced gearbox (6mm) of a Classic Army M15A4 Rifle their appeared a slight problem. Well the problem was that the cylinderhead did not fit over the 2 nocks in the front of the Classic Army gearbox. I also had a Tokyo Marui M733 with a stock Tokyo Marui gearbox lying around and in there the cylinder head fitted nicely and snug. MODIFY already made some slight adjustments and soon we will receive a new Classic Army compatible set. Stay tuned on a update on this review for our final results and thoughts. The modify cylinder is a steel one witch is very nicely polished and very smooth. Nothing more to say really. High quality cylinder against good pricing! The pistonhead is an aluminium pistonhead and has a bearing that seals the cylinder very well, the piston head is a ported design. The website states that it is made of aircraft aluminum alloy. The bearing on the piston head, makes sure the spring can rotate as it gets wound up so it can perform at its best. This will also lengthen the life span of the spring. Also will the bearing cause an additional fps, around 5 fps. We were also very impressed that the parts all fit very well, they are indeed 100% air thight and no FPS will be lossed. This has been tested with our finger on the nozzel and pushing the piston through the cylinder. It was truely impossible to do this, it all was air tight! The springguide in this kit is a full steel springguide with a bearing, the full steel springguide is also well constructed but has another slight problem when you try to fit it to a Classic Army gearbox use’s pins to get it instead while a Tokyo Marui gearbox uses round pins to hold it in place instead of the flat ones, this again will be addressed in a kit that is Classic Army compatible. The full steel springguide will make more noise then a stock plastic one but is a lot stronger and the bearing again insures longer spring life and a slight increase in fps. This springguide base and the two wings are shaped in one-piece, this to make a high durability. The two wings are the weakest part of a spingguide and MODIFY ensured this problem is history. This springguide can handle up to a M170 spring, so don't worry about any durability! Using it with a M120 spring (340-350 FPS) will make it run for ages. We have used some prices from Stormtec and Arco & Frecce to compare. First of all we think the quality of SYSTEMA parts and MODIFY parts are comparable here. So we do not compare aplles with pears here. As you can see prices on MODIFY are very well! Most of the parts are below SYSTEMA prices and quite a lot. However the AREA 1000 cylinder of SYSTEMA is a little cheaper but we do not know the quality of it and so we don't know if it is comparable or not. These parts of MODIFY do see a bright future we think. Good quality parts with good prices! And the company itself is listening very good to feedback and has great service. Compatibility problems will be solved soon! Stay tuned on this review since we will provide an update when the improved Classic Army compatible parts have been received. When we have fully upgraded our Classic Army gearbox we will also take some nice shots of the internals installed! MODIFY is a company from Taiwan specialised in precision metal parts, turning industry tools and precision machine attachments such as Airsoft Custom Parts, R/C Car Upgrade Parts etc. They have 40 years experience in the industry and their products have a high reputation for quality and value. MODIFY is still a new brand here in Europe, but rapidly increases it's popularity. They mainly aim at high quality airsoft upgrade parts and accesoires for the gearbox. We would like to thank MODIFY and also Begadi.com for providing us this review opportunity. Please read along and find out more about the MODIFY Modular Gearset. The complete set, some Stainless bushes (6 pieces), Modular gears with tempered stainless bushes (double oil grooves), Synthetic lubricant with PTFE, a little A4 manual and the Anti-reversal latch. Detailed picture of the lubricant, includes PTFE and looks just fine. Not big but more than enough. Detailed picture of the 6 Stainless bushes, good quality finish. Detailed picture of the master piece itself. Remark the writing on it, "MODIFY" and "Speed 16.32:1"
The complete set together with a TM MP5 gearbox. Here starts the most enjoyable part of all this. We are ready to install the MODIFY Modular Gearset, see how easily it will fit in. Please follow the detailed installation pictures below, and also check the picture comments we made! Installation: Not really neccesary but we did a little gear grease on there, remark just a little and not too much! Installation: Install the module and put a few drops of the lubricant on the double oil bushes. Installation: Now install the Anti-reversal latch, again see the groove on top of it. Remind to install the little spring right! Intallation: Check if the modular gears are properly installed, not hit the gearbox and not hit the wires! Installation: This is the CA B&T MP5 gearbox, you can clearly see the problem with the Modular Gearset, On the left part of the gearbox there is no room for the rack of the Modular Gearset. Installation: Be carefull to install the tapped plate right as shown on the picture! Installation: This is after.... Now you are done with it, this can be done within 15 minutes! We will do extended performance test during our next skirm. Rate of Fire and FPS will be checked. We also have a nice supprice, we will test this MP5 with a new SYSTEMA Speed motor. This really sounds like an ultimate speed version! When we have enough time we hope to compare this speed set, with a torque set! So a MODIFY Torgue Modular Gearset and a SYSTEMA Torgue motor. We will also compare it with the stock CA parts. We are exited and will keep you posted, stay tuned! Please find below a scan of the manual with some instructions and maintainance tips included. Click for a larger version, remark 4MB large! The beauty of this product is that it combines high quality standards together with innovative design and functionality. * The gears come in a rock solid unit. * Properly aligned, no shimming needed. * Will fit nearly all brands of gearbox (except CA reinforced, remark: we did not test all). * Will work in non-aligned gear boxes. * Comes in a very complete set, all you need is available. * Individual gears can not (yet) be replaced. * For those who love CA, it will not fit into an reinforced gearbox! I will give the Modify Modular Gearset a 9 out of 10! I really would like to give it a 10 out of 10 but I found 2 minor con's (where the CA gearbox is not even MODIFY their fault). However this Modular Gearset is very impressive, the first gears MODIFY make and they nailed it! Most important is that the innovative design is a large step forward in gearbox engineering. Some good idea's and engineering really made this a very nice and easy to install kit! It only takes several minutes and you don's need to worry about shimming issues. It is great to see how it combines high quality standards together with innovative design and functionality. We like MODIFY, give them a try yourself! You won't be disappointed.